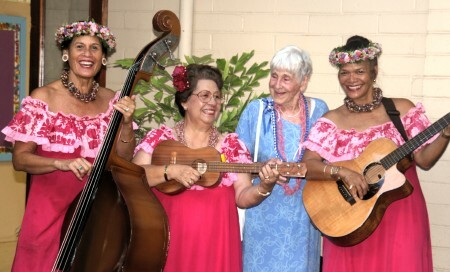 Irmgard Hormann, founder of Hawai‘i Meals on Wheels, passed away on October 9, 2016 at age 99, but her kind heart and genuine goodness will never be forgotten. Her generous spirit continues to influence Hawai‘i Meals on Wheels today. In 1979, more than almost 40 years ago, Irmgard Hormann, saw that older adults in Honolulu were not receiving proper nutrition and attention because they were homebound and virtually cut off from the rest of the community. Her solution: she would bring the community and hot meals to them. This was the start of Hawai‘i Meals on Wheels began. After 40 years of service as a State librarian, Irmgard had retired in 1972 from the State of Hawai‘i’s main library after 40 years of service, where she pioneered the state’s young-adult library program. She retired to become a caregiver to her mother, who had broken her hip. “I needed to take care of mother, but I also wanted to do some good work with my church. That was always important in my family,” she said. So at age 63, Irmgard embarked on what became a second career as a tireless volunteer and advocate for social services in Honolulu. Irmgard was the daughter of the Rev. Dr. Arthur Hormann, the longtime pastor of the Lutheran Church of Honolulu, and Maria Hormann, a professor who helped start the German Department at the University of Hawai’i. She had developed a finely attuned social consciousness through her parents’ example, and could not in good conscience turn a blind eye to the needs of others before her. Irmgard felt compelled to fill the unmet need in the community. As the founder of a new, start-up nonprofit organization, Hawai`i Meals of Wheels, Irmgard did everything by herself at the beginning, including delivering hot meals to homebound seniors and disabled people. “I’ve experienced great joy in working with Hawai’i Meals on Wheels. One feels that one has done something that is very much needed. We cannot forget the people that we serve and we must reach out to help them,” Irmgard once said. Eventually, she recruited a board of directors and all of the volunteers, organized volunteer appreciation luncheons and teas, including cooking, baking, providing silver tea service and serving. She also performed all of the administrative duties prior to hiring an executive director, including collecting funds, filing taxes, filing for and obtaining nonprofit status. Irmgard also coordinated and planned all major events during the first two decades of the organization. During those early days of the organization, Hawai‘i Meals on Wheels had just six clients, six volunteers and two routes. By contrast, today Hawai‘i Meals on Wheels serves more than 650 homebound clients with 400 volunteers on nearly 50 routes throughout Oahu, clearly showing how far the organization has come over the years. Her fondest memories are of delivering meals. “I remember my brother and me taking meals to an older Japanese woman isolated in a tall apartment building. She would always go to her front balcony and wave to us and blow us kisses as we exited the building,” Irmgard recalls. Irmgard helped to recruit others from her church to volunteer and has recruited church groups of other denominations, creating a multi-faith group of original volunteers. She also recruited her relatives to help out on delivery routes. In her role as a delivery driver, she has had the opportunity to bring personal interaction to lonely seniors and created opportunities for other drivers to help homebound clients. She attended kindergarten at Hanahau’oli School and transferred to Punahou School for first grade. Thanks to her strict German mother, who did not believe in summers off, she graduated early from Punahou and entered the University of Hawai’i at age 15. After UH, her parents took her to Europe “where I was supposed to spend a year and really learn French and German and become a cultured person.” But it was 1938, and war was imminent. So after a summer in Berlin, Irmgard landed in New York City, to earn a master’s degree in library science at Columbia University. After receiving her master’s degree, Irmgard returned to Hawai’i in 1939, working first on Kaua’i. Her first job was with the Library of Hawai’i in Lihue, Kaua’i, a place she knew and loved since childhood because her father had served the Lihue Lutheran Church as pastor of the Lutheran Church of Honolulu for 30 years. She eventually moved to Oahu, and served as head of the Young Adult section at the main Library of Hawai’i for many years. Irmgard’s boundless, positive energy extended to other organizations. 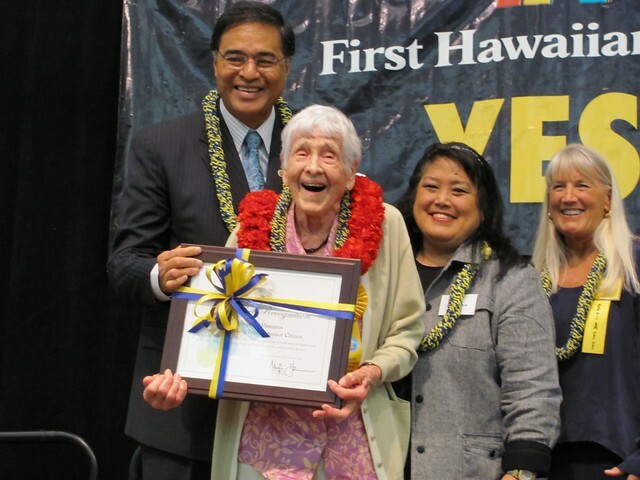 In addition to Hawai‘i Meals on Wheels, Irmgard has volunteered for the Friends of the Library, IHS (Institute for Human Services), Lutheran Church of Honolulu, and FISH (Faith in Service of Humanity, another organization she founded, which offered volunteer drivers to take seniors and disabled individuals to their doctor’s appointments. 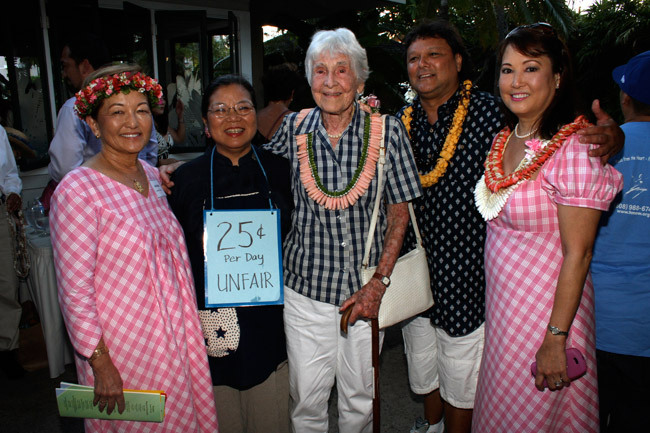 In 2010, Irmgard was honored with the Outstanding Senior Volunteer Award at the Mayor’s 44th Annual Senior Citizen Recognition Program, which honored individuals and organizations for their contributions and support of Hawai`i’s older adult population. Irmgard Homann receiving volunteer recognition award in 2010. Despite her accomplishments, Irmgard’s most outstanding trait is her humility and desire to downplay her lifetime of contributions to our community. She refuses to take credit where it is due and always talks about her volunteering with self-deprecating grace and with humorous stories punctuated with lots of laughter and twinkling eyes. “Believe me, people give me too much credit. Helping others gives you such a good feeling. It’s that human contact that makes life fun,” she said. Mahalo to Irmgard for starting Hawai‘i Meals on Wheels and for allowing the community to carry on what you have begun!